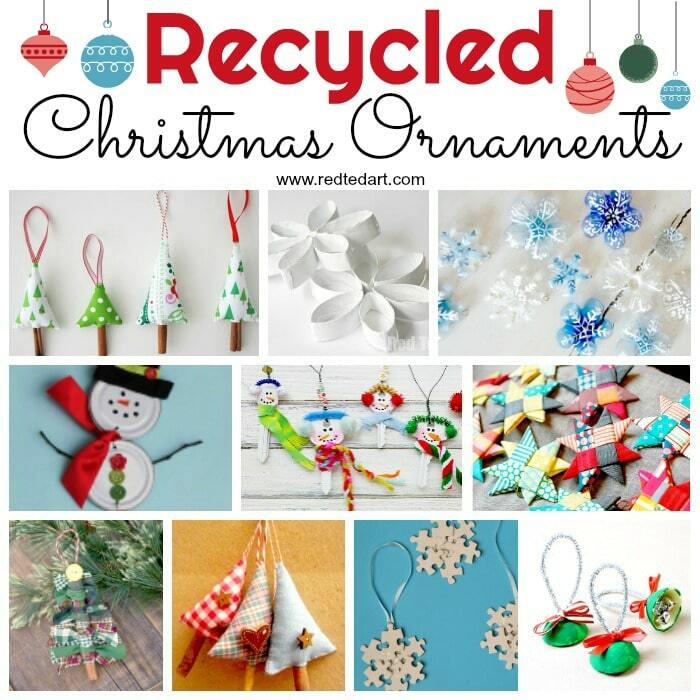 With the holidays almost here, the relatives about to descend upon us, and presents aplenty needed for your frinds and family, why not enlist the children in making these gorgeous and creative gift-worthy recycled ornaments? I’ve rounded up 20 of the most colourful and fun to make ideas from around the web to start you on a creative path. Make memories that will last a lifetime – I still have the salt dough ornaments we made as children! Choose a few or all and you’ll have loads of things to hang under your own tree or someone else’s. And best of all you get bonus points for going green and making eco-friendly gifts! 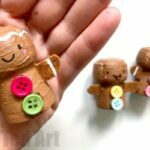 Recycled Toy Ornaments from The Gingerbread House – What a wonderful use for those little toys and Toob figurines that the kids are done with! Puzzle Piece Wreath Ornament from There’s Just One Mommy – Brilliant use of a recycled puzzle! 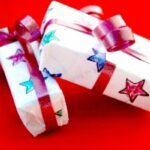 Super cute matchbox presents – quick and easy and just adorable! Cardboard Photo Frame Ornaments (so cute) by I Heart Crafty Things. Cardboard Cookie Cutter Ornaments from The Deliberate Mom – Recycling at its tastiest, sort of. DIY Upcycled Birdhouse Ornaments from Rhythms of Play – These might just be my favourite of the bunch. So many wonderful ideas here though! 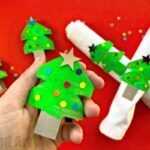 Paper Mache Christmas Tree Ornament from Buggy and Buddy – C’mon, it’s messy and sloshy, but we all love to play with paper mache, and these crafts are worth the cleanup. Recycled Christmas Card Snowflake Ornament from DIY Inspired – If you kept last year’s Christmas cards, here are the ornaments that will convince you to cut them up with the kids. Egg Carton Jingle Bells from Fantastic Mum Learning – Simple, readily available, and your ears as well as the tree will ring throughout the holidays. 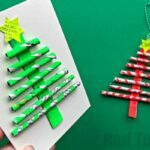 Make gorgeous keepsakes out of upcycled jumper ornaments – I used my kids’ baby cardigans to make a snowman and Christmas tree! 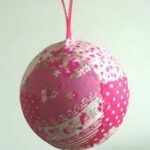 Fleece Recycled Christmas Ornament from Teach Me Mommy – Tactile and fray-free crafting. Scrap Fabric Tree Ornament – this would be a DARLING keepsake from all those scraps.. by Fireflies and Mudpies. Combine old fabrics with cinnamon sticks to make these delicious Cinnamon Fabric Trees by Piece of Mind and Lu Loves Handmade. 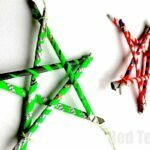 Learn how to make these fabric stars by Crafting a Rainbow. Fabulous Patchwork Stars by Ros Made Me. More fabulous Fabric Trees (great as a garland) by sixty one A. Cute wooly sweater letter ornaments by Craft Buds. Olaf – who doesn’t love Olaf?! A great craft for Champagne Corks! Cork Mushrooms and Elves made from Champagne Corks. The perfect shape! More Cork Ornament Ideas here. Kindersuprise Egg Capsules – turn them into adorable Pokemon Ornaments or..
.. Kindersuprise Egg Fairies (these were originally tooth fairy boxes.. but they would be great as ornaments too though, right? Recycled CD Glittery Bird Ornament from School Time Snippets – These are just beautiful! 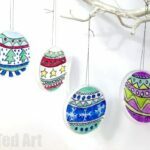 Recycled Stained Glass Ornaments from Housing a Forest – These are unbelievably beautiful and you’ll want to make a pile of them for every recipient on your list…..if you can bear to part with them. Plastic Cup Shrinky Dink Ornaments from The Chaos and the Clutter – Remember Shrinky Dinks? Have you ever made them with your own children? If not, here’s how. 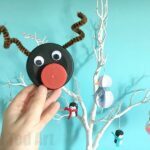 Easy Rudolph Reindeer Ornament – This is so cute, any grandparent would love it. Mason Jar Ornaments from Inspiring 2 N.H Kids – I think we all have a mason jar (or twenty) lying around, so why not use them for this creative craft? Jar Lid Baubles Easy Christmas Craft from Arty Crafty Kids – And, a use for the lids from number 5 above! Perfect symbiosis. 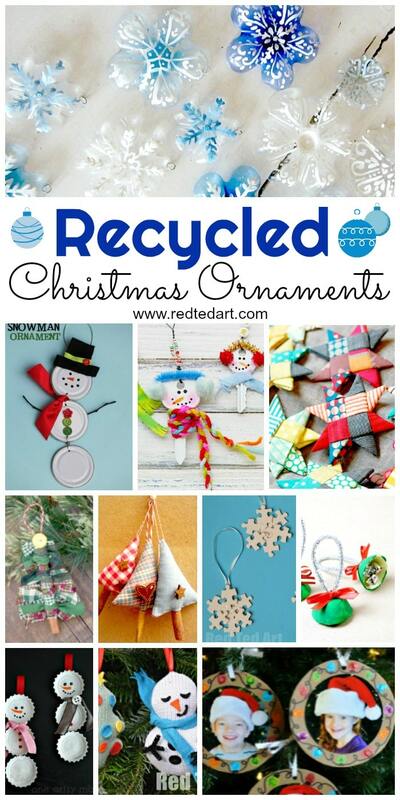 Festive Recycled Jar Lid Ornaments from Artsy Momma – Yet another use for your jar lids. So pretty, too. Recycled Can Lid Snowman Ornament from Things to Share and Remember – Finally, a great use for can lids!